Louis Westacott. Photograph by H.S. Shuster bet. 1880-1889. Willamette Heritage Center Collections 85.17.001. Louis Westacott was Lewis Westacott’s son. 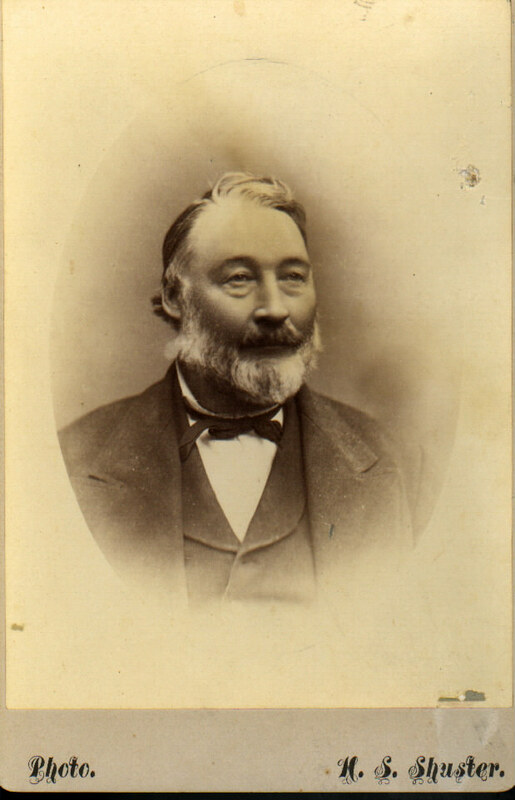 The elder Westacott spelled his name “Lewis” after the birth of his son. “Obituary,” (Salem, Oregon) Daily Statesman, 26 May 1889, SalemPioneer Cemetery.com (http://www.salempioneercemetery.org/records/display_record.php?id=7157 : accesssed 5 Mar 2015), citing p. 4 col. 3 in the original. “Died—Westacott,” (Salem, Oregon) Evening Capital Journal, digital images, 27 May 1889, p. 4 col 4, Historic Oregon Newspapers (http://tinyurl.com/jvjrk8q : accessed 5 Mar 2015). Jean Custer and Daraleen Wade, Marion County, Oregon Marriage Records 1849—1871, (Salem OR, Willamette Valley Genealogical Society : 1979), Westacott—Allen, p. 8. 1860 US Census, Salem, Marion, Oregon, p. 399 (penned), dwelling 3488, family 3228, L. Westacott household; Ancestry.com (http://www.search.ancestry.com : accessedd 5 Mar 2015); citing NARA film M653, roll 1056 and FHL film 805056. 1870 US Census, Salem, Marion, Oregon, p. 79 (penned), p. 40 (stamped), dwelling 669, family 614, Lewis Westcott [sic] household; Ancestry.com (http://www.search.ancestry.com : accessed 5 Mar 2015); citing NARA film M593, roll 1287 and FHL film 552786. 1850 US Census, District 7, Dubuque County, Iowa, p. 65 (stamped on reverse), dwelling 925, family 964, Obadiah Allen household; Ancestry.com (http://www.search.ancestry.com : accessed 6 Mar 2015); citing NARA film M432, roll 183. “Obituary,” (Salem, Oregon) Daily Statesman, 26 May 1889. 1860 US Census, Salem, Marion, Oregon, p. 399 (penned), dwelling 3488, family 3228, L. Westacott household. Samuel H. Williamson, “Seven Ways to Compute the Relative Value of a U.S. Dollar Amount, 1774 to present,” on line calculator, MeasuringWorth.com ( www.measuringworth.com/uscompare/ : accessed 6 Mar 2015). “Old ‘Hop Juice’ Unearthed in 1909 on Minto Property,” CapitalTapes (http://capitaltaps.blogspot.com/2009/12/old-hop-juice-unearthed-in-1909-on.html : accessed 5 Mar 2015). 1870 US Census, Salem, Marion, Oregon, p. 79 (penned), p. 40 (stamped), dwelling 669, family 614, Lewis Westcott [sic] household. Cox and Earhart, “Salem Directory of 1871,” facsmile, Ancestry.com (http://www.search.ancestry.com : accessed 5 Mar 2015), p. 121, entry for L. Westacott. Salem Pioneer Cemetery, (http://www.salempioneercemetery.org/records/display_record.php?id=7154 : accessed 6 Mar 2015), entry for Mary E. Westacott. “Directory of the City of Salem [etc. ], (1880), p. 125, digital images, Ancestry.com (http://www.search .ancestry.com : accessed 6 Mar 2015). 1880 US Census, South Salem, Marion, Oregon, enumeration district 79, sheet 1A, p. 13 (stamped), dwelling 4, family 4, Lewis Westacott household; Ancestry.com (http://www.search.ancestry.com : accessed 6 Mar 2015); citing NARA film T9, roll 1082 and FHL film 1255082. This entry was posted in History Tidbits, People, Uncategorized and tagged Ada Westacott, Astoria and Willamette Valley Railway Company, Beer, Brewery, Commercial Street, John Minto, John Westacott, Lewis Westacott, Louis Westacott, Mary E. Allen, Mary E. Janes, Mary E. Westacott, Mission Street, Obadiah Allen, Richard H. Westacott, Saginaw Street, Salem, Westacott and Sons, William G. Westacott. Bookmark the permalink.